Passion fruit comes in a couple of different varieties. Passion fruit is one of the few antioxidant fruits that not only improves your physical health, but also your mental health. Native to areas ranging form southern Brazil, Paraguay, all the way to Argentina, this fruit can be used in the treatment of anxiety, depression, and even sleep disorders like insomnia. Passion fruit comes in two varieties. One is a dark purple color once it has reached maturity and has a less acidic, richer taste. The other turns yellow at maturity and is typically large than the purple kind. Unlike the purple passion fruit, the yellow passion fruit does not have a known origin, although people have speculated that it may be Brazil. 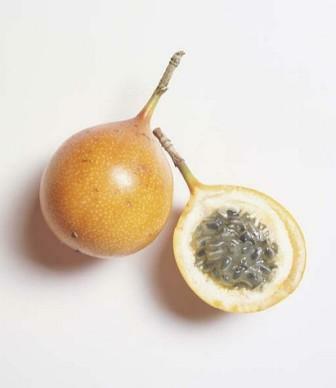 Passion fruit goes by many names, its scientific one being Passiflora edulis for the purple fruit and Passiflora edulis flavicarpa for the yellow, while another common name is Granadilla (or Purple Granadilla). Purple passion fruit is a subtropical fruit that will only flower and fruit in altitudes above 3,200 ft. Yellow passion fruit is tropical and can be grown from just above sea level up to the altitude of 2,000 ft. It is interesting that these varieties of passion fruit differ to such a degree. The people of Brazil tend to use the purple fruit to eat raw, while they prefer the yellow fruit for juice extractions and the creation of preserves. Australians absolutely love the purple passion fruit and vastly favor it over the yellow for all preparations. The flowers of the passion fruit vine have been used traditionally in folk medicine as a calming agent, usually for the purpose of helping someone fall asleep. Researchers who published a study in “Phytotherapy Research” were able to find that the flowers had a depressant effect on the nonspecific central nervous system. Another study in “Anesthesia and Analgesia” tested whether the flower could be used to effectively treat anxiety in patients about to undergo surgery. The results were positive – that passion fruit flower can reduce anxiety without necessarily causing sedation. While passion fruit and its flowers (and even its vine) can have positive effects on your mental health, it is worthwhile to make sure this plant doesn’t have any contraindications with the medicine you’re on. If you’re taking medication regularly, check with your doctor that it’s safe for you to try passion fruit flower before doing it. Better safe than sorry! The yellow passion fruit, also known as the maracuya, has traditional medicinal uses as well. Similar to cranberries, its juice can be used to treat urinary tract infections. Passion fruit has also shown potential in treating asthma, thanks in part to its vitamin C and potassium content (although that’s not the only reason). Passion fruit is one of the vitamin, mineral, and fiber rich fruits when it comes down to it. Currently, there is research being done to establish whether passion fruit can fight chronic inflammation. If so, this is just one more benefit to add to the ever-expanding list. Traditional medicine uses it for urinary tract infections, much like the cranberry. The Vitamin C, potassium and other relaxing agents in this fruit, may help with asthma or spasmodic coughing conditions. Studies suggest that the Fruit can fight chronic inflammation, which is increasingly being linked to more diseases. 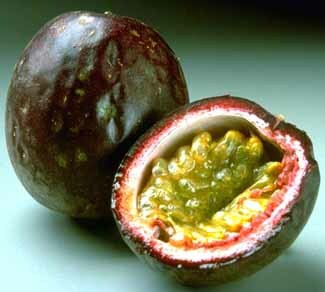 See common names for the Fruit by going to our Passion Fruit Names webpage. An excellent source for more information about the passion fruit is on the Califorantioxidant-fruits.coma Rare Fruit Growers’ website. I love the fruit but unfortunately have become allergic to it.Break out in bumps and itching.Swelling around eyes.Any ideas on cures? this is interesting. i recommend Markizza Passion fruit juice on amazon. the taste is just perfect.